He has battled crime alongside Batman. He has his own action figure and comic book. Poe has appeared in film, television, and other people's novels. His name has become inseparable from the revolutionary horror tales he wrote. Is this Poe purely the creation of popular culture, or is there something of the real Poe behind the reputation? Poe has become an icon of American popular culture. Just as his literary works continue to be read and adapted into films and music, Poe's life also inspires today's writers, artists, and advertisers. Although the melancholy, tormented Poe of popular culture is as much a creation of the media as a representation of Poe's own life, it is fitting that he should appear as a fictional character in other authors' works, like the recent novels The Poe Shadow and The Pale Blue Eye or in the graphic novel Batman Nevermore, in which Poe joins forces with the superhero to battle evil. "The Cask of Amontillado". Godey's Lady's Book. November 1846. Library of Virginia. During his lifetime, Poe's critics often attacked the lack of moral content in his stories. His tales did not attempt to teach a lesson or edify his readers. In "The Cask of Amontillado," Poe presented two unsympathetic characters, Montresor and Fortunato. In this tale of revenge, Montresor lures Fortunato into a wine cellar by feigning friendship and then buries him alive. 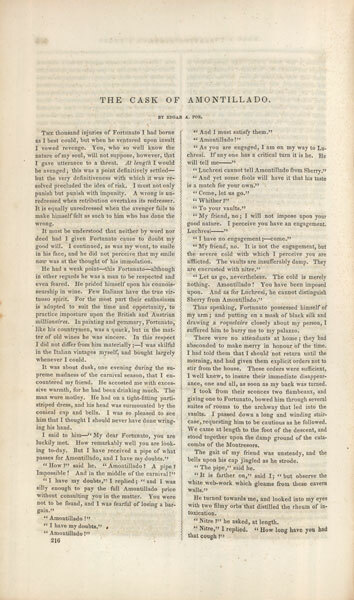 At the time Poe wrote this short story, he was engaged in a literary feud with the writer Thomas Dunn English, who had written a novel in which a caricature of Poe appeared as the drunken author of a poem entitled "The Crow." Some critics believe "The Cask of Amontillado" is Poe's answer to English's attack and that the victim in this story is a caricature of English. Before Poe, Gothic tales by authors such as Horace Walpole and Charles Brockman Brown entertained readers with accounts of haunted castles and family curses that always rewarded virtue and ended happily. Poe overturned this tradition with tales like "The Black Cat" and "The Cask of Amontillado." There is no happy ending to these stories. Poe exerted a profound influence not only on writers but also on visual artists, who were drawn by his tales of insanity, murder, death, and decay. 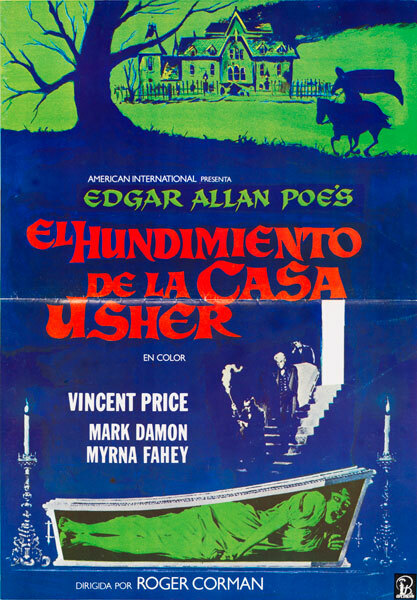 Poe's universal apeal has seen his work translated into every media, including film. Filmmaker Alfred Hitchcock stated that Poe's works inspired him to make suspense films. 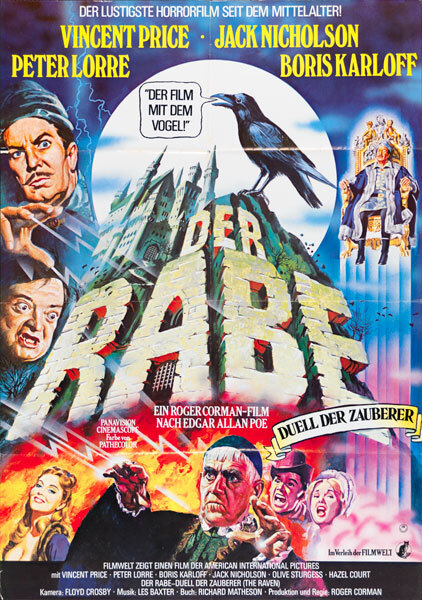 Das Rabe [The Raven]. West Germany. 1960s. Movie Poster. Poe Museum. 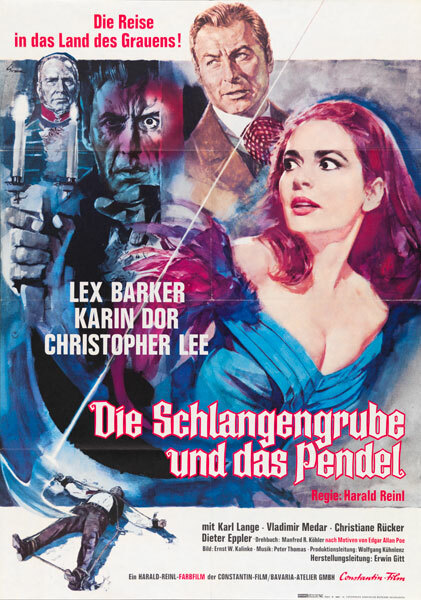 Die Schlangengrube und das Pendal [The Pit and the Pendulum]. West Germany. 1967. Movie Poster. Poe Museum. 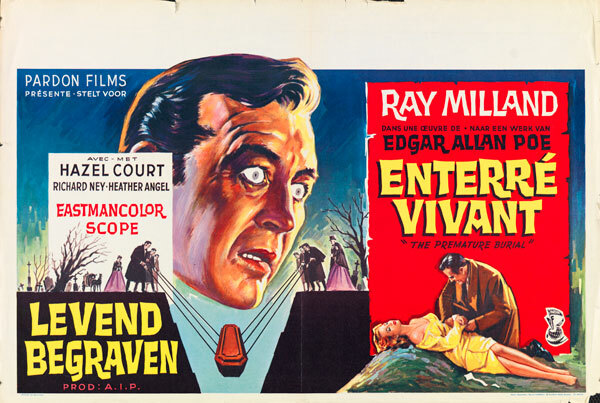 Enterré Vivants [The Premature Burial]. Belgium. 1967. Movie Poster. Poe Museum. El Hundimient de la Casa Usher. Spain. 1960. Movie Poster. Poe Museum.